We want to thank you for sharing this journey with us for the past eight years. Ecouterre.com broke ground in 2009 as the world’s first website dedicated to ethical and environmentally sustainable fashion. We helped to start the conversation about “eco fashion” when that term was fairly unknown, and left most in the fashion industry and general public scratching their heads. Now major celebrities endorse eco-fashion, major retailers like H&M and Inditex integrate environmental practices into their production, and luxury fashion houses talk about “natural capital accounting.” We are thrilled to see how far the conversation has come, and we know that the discussion around how to manufacture apparel responsibly and ethically needs to continue, as there is much work still to be done. We would like to share with you today the fact that the Ecouterre website will be folding back into our original mothership, Inhabitat.com. When we spun Ecouterre off from design website Inhabitat.com in 2009, it was because we felt there needed to be a separate space for conversation dedicated to eco-fashion, apart from Inhabitat, which was covering a wide range of human design, including architecture, urban design, product design, and industrial design. 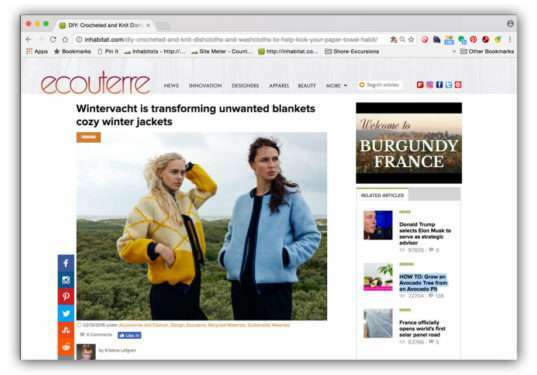 While this separate conversation for fashion still feels so necessary, the rapidly changing dynamics of internet publishing has fundamentally altered Ecouterre’s audience, our revenue and the long-term viability of our business operations as an independent website. Because of this, we need to fold Ecouterre back into Inhabitat.com., in order to sustain the content and mission of our work. We want to thank our dedicated readers for taking this journey with us, and we hope you will join us over on Inhabitat.com for our next chapter in fighting the good fight for sustainable design. Thanks for all the good effort put into these articles these past years!! I was wondering if URLs will change for all archived articles or will the current ones still work but just will be redirected to their new locations?